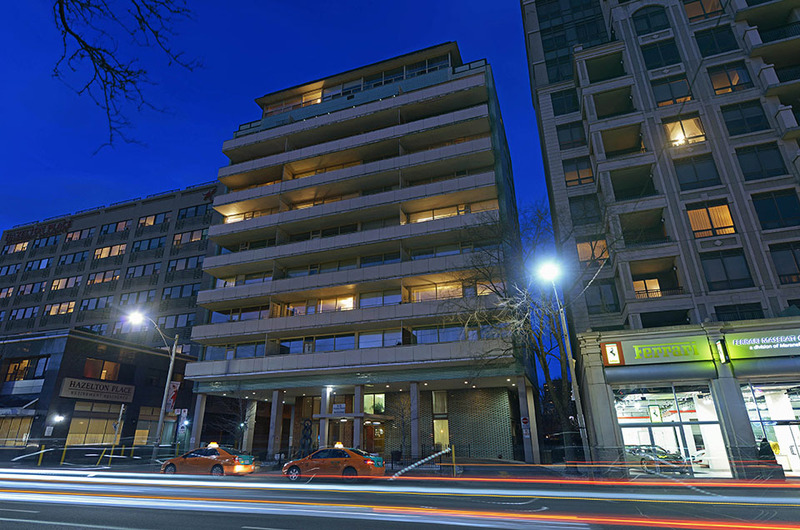 Toronto, ON, April 7th, 2015 — Hollyburn Properties Ltd, a Canadian property management and investment company, has acquired a coveted rental building in the illustrious Yorkville neighbourhood of downtown Toronto for $42,500,000. Located within the defined downtown and central waterfront area next to Ferrari-Mazerati and Whole Foods, 103 Avenue Road is a 10 story rental apartment property with 125 units on a 100 ft x 276.39 ft lot. The offering included two additional 25 ft x 150 ft lots fronting Hazelton Avenue – an acclaimed two block street in the heart of Yorkville that features some of the most desirable homes in the Toronto region. The transaction aligns with Hollyburn’s expansion in Ontario, furthering growth in triple A locations in proximity to transit lines and the finest amenities. 103 Avenue Road is located adjacent to two luxury car dealerships, designer retailers, a Whole Foods supermarket, the TTC subway and Hollyburn’s flagship property, 20 Prince Arthur. The site, designated Mixed Use Areas, permits a broad range of commercial, residential, and institutional uses in single use or mixed use buildings, as well as parks, open spaces and amenities. Vito Campisi and MCAP Financial Corporation provided the CMHC insured financing. Since 2010, Hollyburn Properties has completed more than 22 property investments in Toronto, Ottawa, Calgary and Vancouver, totaling more than $350 million in value. Hollyburn Properties Limited is a Canadian-owned and operated property management company. Established 40 years ago, Hollyburn is a family-run business at the forefront of the property management industry, dedicated to providing the finest rental apartment homes in three provinces across Canada. Hollyburn currently manages and operates 74 communities nationwide, with approximately 5,000 suites in Vancouver, Calgary, Toronto and Ottawa. It is our mission to maintain the highest standard of living in the apartment rental market.